Wartime often catalyzes developments in philanthropy. 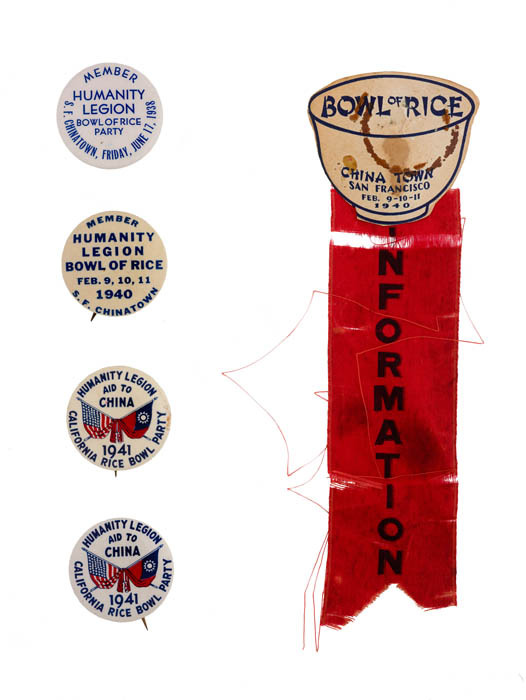 In 2017, the museum added the Bowl of Rice party banner, from fundraising efforts to aid people in China during the Second Sino-Japanese War, to its collection. Curator Theodore S. Gonzalves, a scholar of Asian American history, answered three questions from our philanthropy curator, Amanda Moniz, about the story this object tells. This banner is very striking. What can you tell us about the story behind it? The banner was most likely used during one of the Bowl of Rice parties that were held throughout the country annually from 1938 to 1941. These events were large, community-based fundraising drives aimed at helping Chinese civilians affected by the Second Sino-Japanese War. Organizers held the events in the major Chinatowns of the day—New York City and San Francisco—as well as in 2,000 cities throughout the country. A banner like this would have been displayed along the busy streets that lined parade routes. The fundraising activities included elaborate dinners, concerts, sporting events, radio shows, and pageants. Commemorative buttons and a ribbon from the Bowl of Rice Parties. I'm curious about the impact of these fundraising efforts. Could you tell us about the impact both in China and on American philanthropy? Missionaries and other Westerners working in China reported that many were affected by the war. The figures of those affected ranged from 60,000,000 to 160,000,000—in need of food, medicine, and shelter. Dramatic accounts stated that refugees were facing "the greatest health danger that the world has known since the Black Death." In the United States, Colonel Theodore Roosevelt Jr. was named the national chairman of the United Council for Civilian Relief in China, an organization that staged the first of these events in June 1938 in New York City with 85,000 attendees. Members of the Chinese community living in the United States formed the Chinese War Relief Association. 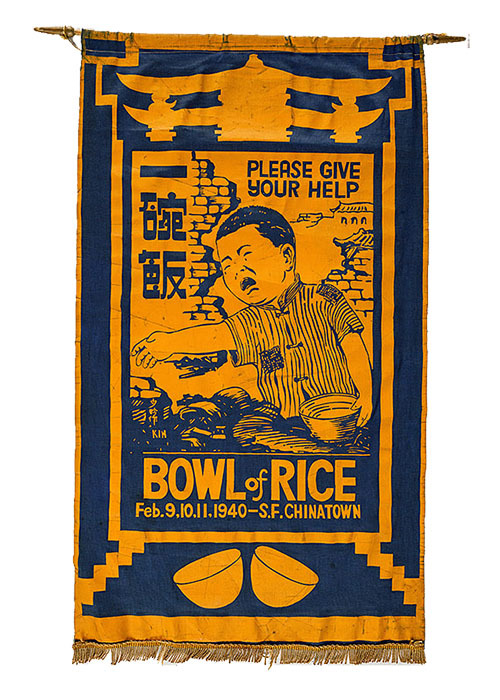 The 1940 Bowl of Rice party in San Francisco's Chinatown drew crowds as large as 275,000, raising $80,000. 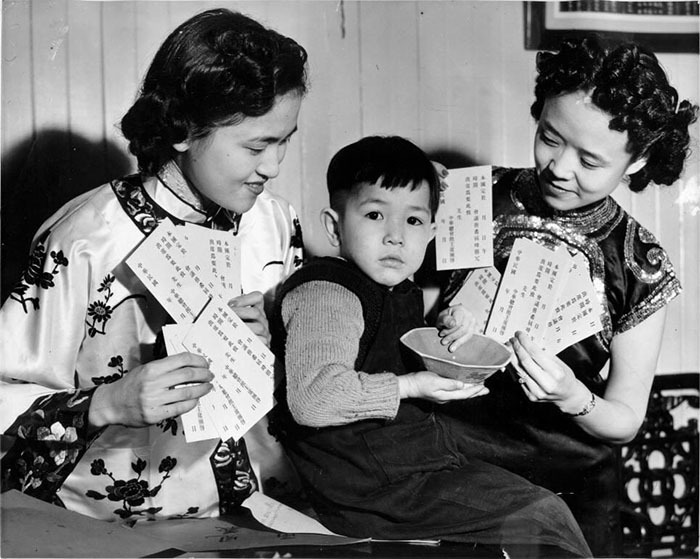 Mary Owyang and Pearl Chung hold up invitations for a Bowl of Rice party while Harry Yee holds up a bowl. Courtesy of San Francisco History Center, San Francisco Public Library. This banner reminds us there's a long history of Chinese American philanthropy. What can you tell us about giving—of time, talent, or treasure—in the Chinese American community in the late 1800s and early 1900s? These fundraising drives featured a common effort but had multiple goals. Western missionaries saw these efforts as part of their humanitarian duty in a foreign land. But think about the overseas and Chinese American communities in the United States. Elders in New York City and San Francisco would have been old enough to witness the passage of the 1875 Page Act and the 1882 Chinese Exclusion Act—laws that anchored anti-Chinese sentiment in what would become a formally segregated nation. The motto of New York City's Chinese Hand Laundry Alliance—"To Save China, To Save Ourselves"—made things explicit. Chinese in the United States saw their local struggles for civil rights as part of international conflicts. The Bowl of Rice parties became opportunities for organizers to fight the discrimination they faced in their new homes by pressing for the liberation of their homeland. Thanks for sharing this fascinating history. The banner helps us explore the story of Chinese American humanitarian fundraising and civil rights activism. There are other stories I hope to uncover. I'm especially curious about who created the banner and how that work fit into the creators' business. As we build a new national philanthropy collection, the opportunity to learn about the objects used in fundraising and in benevolent projects is very exciting. If you have information about this banner, we invite you to share it by emailing philcollection@si.edu. Theodore S. Gonzalves is a curator in the Division or Culture and the Arts. Amanda B. Moniz is the David M. Rubenstein Curator of Philanthropy in the Division of Home and Community Life.